Back In The Gi » Blog Archive » Thoughts about belts and ranks. Thoughts about belts and ranks. Let’s face it. 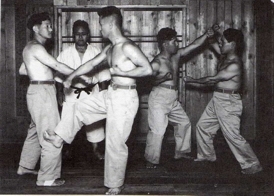 Like it or not, ranks are a significant part of modern martial arts training. We line up in order of rank, we may be split into different classes according to rank, and what we learn is often structured according to rank. And as much as the coloured belt system may provide individual students with a series of personal milestones on their karate journey, they also serve as an indicator of one’s status that others perceive at a glance. I’ve been thinking about belts and ranks off and on since I started training again. As you know, I reached the level of brown belt in my previous dojo, but started again at white belt in my new one. This was cause for some reflection on whether karate ranks are permanent (like, say, graduating with a university degree) or are contingent on continued training (like holding temporary title at one’s job). I have seen both views expressed on martial arts blogs, and I probably would have argued at one point that if you’ve earned a particular rank, you always have it — although obviously you may not live up to it if you don’t keep up your training. However, I think I am now much more in the camp that says you shouldn’t wear the belt unless you are currently at the appropriate skill level. I can see moving up through the ranks more quickly, or even being allowed to wear your old rank once you’ve demonstrated the required level of proficiency, but just showing up on day one with the old rank would not make much sense. This post over at KarateByJesse makes a pretty good case for this view, I think. A while back, we received a phone call to the dojo. The call came from somebody who had been training Karate once (a long time ago), and now wanted to continue. Obviously, somewhere along the way his career, wife and kids had come along, leaving Karate pushed aside. But now he was ready to rock ‘n roll again! “Sure, why not? No problem at all, just come by the dojo when we have class. You can just wear regular clothes if your old gi doesn’t fit.” I told him. But… even though I didn’t have a problem with anything he said, it seems he had a problem with what I’d just said. At this point I’m wondering if I just heard right, or if I needed to dewax my ears. Apparently, this fella’ who hasn’t been training for 10+ years, feels like turning up for his first session wearing his blue belt. A real blast from the past. Just like his real skills weren’t as important as his perceived skills. I could hear his face turning red. That was being kind. Really, I would have wanted to say: “Hey, you know what? I have an even better idea: Why not just wear my black belt instead? Sure, it’s a little worn, but that just adds to the blackbeltness! And it has “Jesse” written on it, but you can just scratch that away. What the heck, you can probably special order a golden belt with red stripes and built in laser cannons on it from the internet and wear that instead! So, that’s one question about belts and ranks to consider. Are they permanent, or dynamic? It’s a complex issue, no doubt — and feel free to weigh in on it in the comments section. What about something simpler, like whether or not you can wash your belt? Well, this too is something about which people differ in opinion. My first time through, I never washed my belts. It would remove the chi! But wait — I don’t believe in chi as a physical substance, and if I did, I don’t think it would be stored in my belt. Now, I wash my belt whenever it gets especially sweaty — mostly as a courtesy to my fellow students and because who wants to wear a stinky, sweaty belt? Others seem to have reached the same conclusion, such as in this blog post in which the author was asked by his Sensei in Japan to please wash his nasty belt. When I arrived in Nagoya, I learned that the other members of my club regularly washed their belts. I discovered this because some of them commented that mine looked particularly well-traveled, and my instructor asked me if I had plans for it and a washing machine to meet and get to know each other better. I took the hint and gave it its first bath that night. After washing it and drying my previously sacred, but now crest-fallen karate belt, I sat down and wondered why in the world I had ever believed that I should not wash it. It survived the washing just fine. It certainly smelled better, and it was less likely to spawn an of outbreak of cholera. What had I been thinking? That the belt police were going to smell my belt periodically to check to see that it still reeked of cheddar cheese? The author of the above post suggests that not washing one’s belt is connected to the myth that people used to receive a white belt that would gradually darken to black after years of hard training. It’s just that, though: a myth. 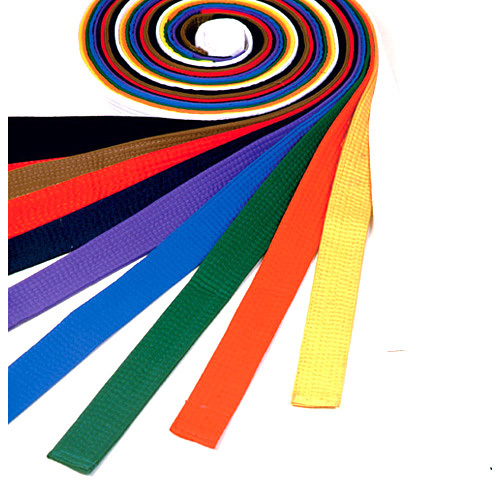 The coloured belt system is a relatively recent development in karate, having been borrowed (along with wearing a gi) from judo. The kyu belt system in judo was, itself, derived from the ranking system in the ancient game Go. So, our belt ranking system traces its roots to a board game. Something to bear in mind, I guess. One such belief that my old sensei used to espouse to me, was the need to free my mind from the pursuit of coloured belts (or grades), and concentrate purely on the quest for excellence in my karate. – “Aim to be the grade, not to get the grade” as he put it. At times, a karateka gets outraged because he didn’t receive the promotion he thought he deserved, while someone he holds to be his inferior gets graded up. Suppose that the comparison is accurate in terms of kicks, punches, blocks, etc. If the discontented karateka, who I will call S., is truly superior in all technical respects, then what he got from karate-dō was genuine proficiency. What the other got was a belt. Bearing in mind that the coloured belt ranking system was brought in largely as a way of motivating students, a bit of a paradox arises. On the one hand, students who train often and hard may develop skills more quickly and therefore should be promoted sooner. On the other hand, these students obviously don’t need as much motivation as students who make it to class only once or twice per week. So, what is a Sensei to do in such a case? I am sure it can be difficult to balance the criterion of demonstrable proficiency with the need to use promotions as a motivator. All I can conclude is that we shouldn’t get too wrapped up in belt rankings. They have their place, and they are indeed meaningful to students (me included), but in the end they are just pieces of fabric that represent a very rough indicator of a student’s abilities. For the disclosure, I earned a Shodan in Meibukan, then I left for college, work ane etc. When I got back into Meibukan, I was allowed to start as a Shodan, a gift. (Thank you). I worked my backside off to meet the requirements before the first day of class. Continued to work my backside off untill I was re-tested and earned Shodan again. Granted, I didn’t care if I started at white. I earned shodan once, and I can earn shodan again. Mainly, because I don’t want to be a black belt in name only.